I grew up having lavish Christmases. Some years it seemed like the gifts were going to swallow the Christmas tree. My parents had fun giving us lots of presents, and we certainly enjoyed receiving them. But, I was also always aware that I had more than I needed or even deserved. My parents helped out other families by buying Christmas presents so that other children would get to have some of that same Christmas joy. And, they didn’t make a fuss about it. I only knew because they were my parents - not because they advertised it. In fact, there are many people that do not know the gifts their children received came from my parents to this day. As soon as our first child was born, my husband and I knew we wanted to do something every year to not only show our Christian beliefs about the birth of our Savior, but we also wanted to find a way to show our son that an easy way to love others is to give. 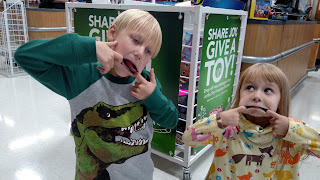 From the time he was born, we have made a visit to Toys R Us in early November to shop for Toys for Tots. Toys for Tots is a well-known, well-respected charity that gives toys to children who live in poverty. While it is one of the most popular charities, they still run out of toys before they reach the end of their list of approximately 7 million children in need. That’s unbelievable, isn’t it? 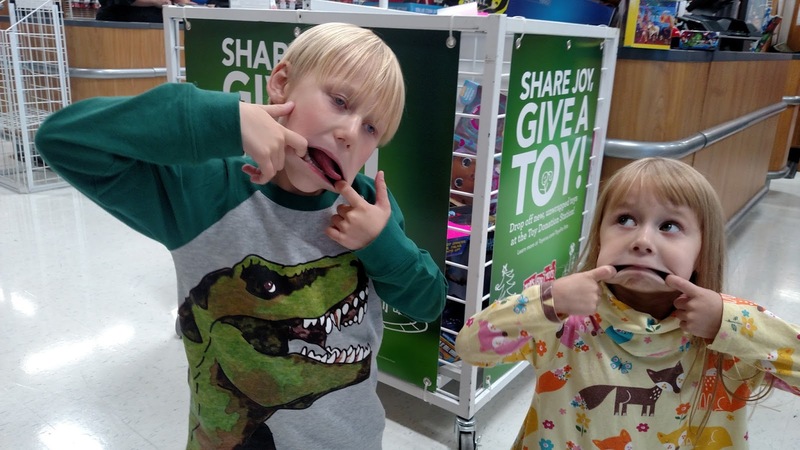 We chose Toys for Tots for several reasons. 1. It is a trustworthy charitable organization. 2. Its goal is to give children a message of hope. 3. It is a tangible way to teach kids that not everyone gets toys at Christmas or has many toys at home. 4. It is a wonderful way to teach little ones how to give to others. When we teach our kids that it is natural to help those less fortunate, it becomes something that they do without complaint. Our kids know what we are doing and why we are doing it. Simply put: We have what others don’t and so we should share. And, since Jesus tells us to love others, we are showing love by giving. It is a tradition my children enjoy and look forward to. Early in November, we head to Toys R Us. We have a budget set for each child. We get the cart and let our children pick out as many toys as the budget will allow that they think another girl or boy will enjoy. We purchase it all and put it in the big bins at the front of the store. Our kids do not cry or get upset when we leave the toys behind. They don’t beg or pitch a fit because we don’t get them something. They happily leave empty-handed because they know where the toys are going. This is not our everyday experience, of course. We have had our fair share of store meltdowns. However, on this special day, our children know what they are doing. And they do it with the joy of a child. The slogan of Toys for Tots is “Share Joy, Give a Toy” after all. See? No complaints after dropping toys in the bin. Just silly faces. You can choose however many toys you want to give, but I encourage you to pick up at least one toy your child wants this Christmas and put it in the Toys for Tots donation box for another child whose parents might not be able to purchase it. Or, choose something to do this holiday season that allows your children to actively participate in giving.